How do you think Brian Braddock would feel about Brexit? Proving once again our maxim that there's no such thing as a "normal" scientist in the Marvel universe, Captain Britain is a brilliant physicist. In our world he'd be working at CERN or something, but because he lives in the 616 [Grand Rapids, Michigan? --ed. ], he serves Merlin and is the living embodiment of the Spirit of Great Britain, meaning that when Brits feel patriotic and happy, he's stronger. He's been the king of the multiverse (orchestrated by Kang for reasons unknown), but gave it all up after his wife Meggan sacrificed herself to save reality from the damage done by Scarlet Witch's "House of M" changes. Like Tony Stark, he's an alcoholic, but got sober after severely injuring a villain he was fighting - and personally paid for her hospital stay and therapy afterwards. As one of Marvel's many Superman-class heroes, Brian naturally uses the big body, a perfect choice for him. He was originally a scrawny hero, but increased his muscle mass when he got rid of his first costume. This suit is the one he wore in New Excalibur, and the only toy it's had before was in the first Captain America movie line. 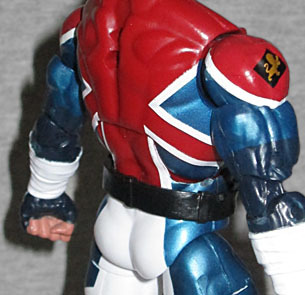 It keeps a lot of the classic features - white pants, military-style boots, the impression of a Union Jack on the torso, etc. - but gives it a modern spin, adding some fingerless black gloves beneath white cloth bracers, and continuing the colors down onto the upper legs. Sometimes the outfit was shown with blue around the neck, but not when it first appeared. The black diamonds on his shoulders have golden lions rampant upon them. His head is a new mold, depicting the helmet that at one point gave him his powers. When this costume first appeared, the head covering was more like a mask or cowl, but the toy includes the chin strap that showed up at the same time as the blue neck (though that one had different stripes on the forehead, and white accents on the chin). Technically the white lines on his helmet should be raised elements, but then we'd wonder why the edges of the blue on his arms and legs didn't get the same treatment. 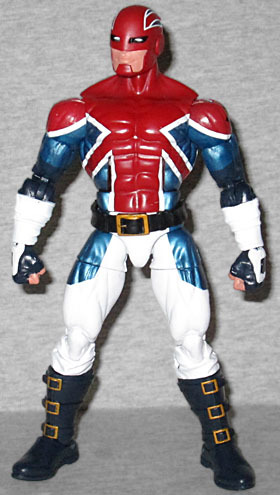 Though Captain Britain is one of the people worthy of wielding Excalibur (it's not like Mjolnir; anybody can pick it up and use it, but he's "pull it out of the stone" worthy), he doesn't come with it. Or any other accessories. Since he generally relies on his strength, he's molded with two fists, ready to punch any villain in his way! All the rest of his articulation is the same that this mold always gives us: head, shoulders, biceps, elbows, wrists, chest, waist, hips, thighs, knees, shins and ankles. He has a loose belt (ie, not sculpted on) that can get in the way of the waist, but just move it up or down and you'll be fine. He does come with a piece of the Abomination Build-A-Figure, the left arm. It's massive! Almost as big as Brian's torso! Bring on the rest of the pieces! 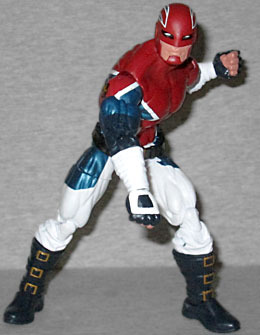 Making Captain Britain and Wonder Man swap figures may seem like a weird choice, byt they do have at least one connection: when ToyBiz made them, they were both repaints of Black Panther. Is that why Hasbro chose to pair them? No clue, but this is a good toy regardless.